LimbIK extends TrigonometricIK to specialize on the 3-segmented hand and leg character limb types. Arm: keeps the arm bent in a biometrically natural and relaxed way (also most expensive of the above). Goal: bends the arm towards the "Bend Goal" Transform. NOTE: Bend Modifiers are only applied if Bend Modfier Weight is greater than 0. The IKSolverLimb.maintainRotationWeight property allows to maintain the world space rotation of the last bone fixed as it was before solving the limb. 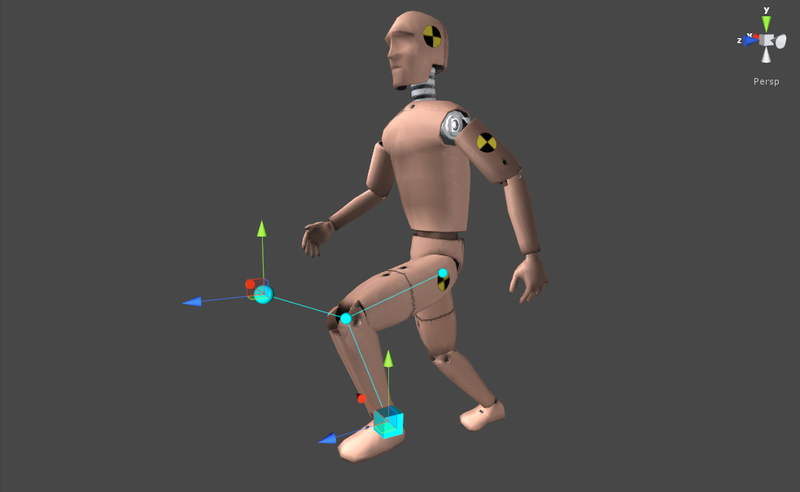 This is most useful when we need to reposition a foot, but maintain it's rotation as it was animated to ensure proper alignment with the ground surface. 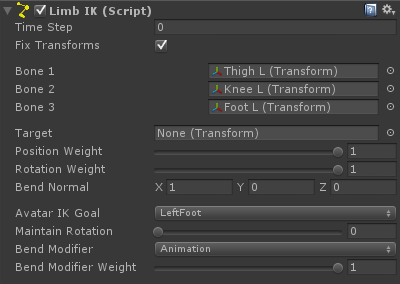 Assign the limb bones to bone1, bone2 and bone3 in the LimbIK component (bones can be skipped, which means you can also use LimbIK on a 4-segment limb). limbIK.solver.bendModifier = IKSolverLimb.BendModifier.Animation; // Will maintain the bending direction as it is animated. // Will try to maintain the bend direction in the most biometrically relaxed way for the arms. // Will not work for the legs.